Ricky? Lucy? Who are these people. Just how old are you anyway? Okay I am kidding. I know who these people are. But seriously isnt being young just doing what you want. Do the young have a bunch of ‘rules’. Hmmmm, I actually think the young have plenty of rules for acting young, starting with “Behave as if you don’t have a bunch of ‘rules’. What do you think? I’d love to hear some young rules, if they’re out there!! Damn! I’m act too old AND I’m the Lucy. Found your site via Meg Cabot’s. Read about 6 posts. Very nice. Keep it coming. I’m putting you on the feed. Thanks. I’m born in 1983 and I have no idea who your ‘post-80’ examples are, but totally get the other examples. And I’m the Ricky. I would rather be Tim Gunn than any of the contestants. Otherwise, I see your point. 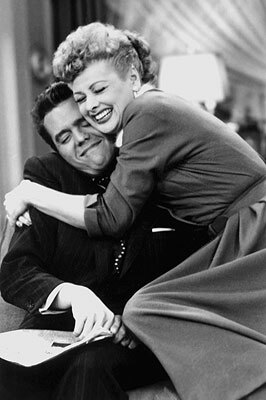 I think my SO and I are both half Lucy and half Ricky, depending on the situation. I am Ricky about credit cards and such. He is Ricky about my tendency to befriend strangers and trust people too much.